I'm always looking for a new way to use up my leftover Thanksgiving and Christmas turkey, aren't you? 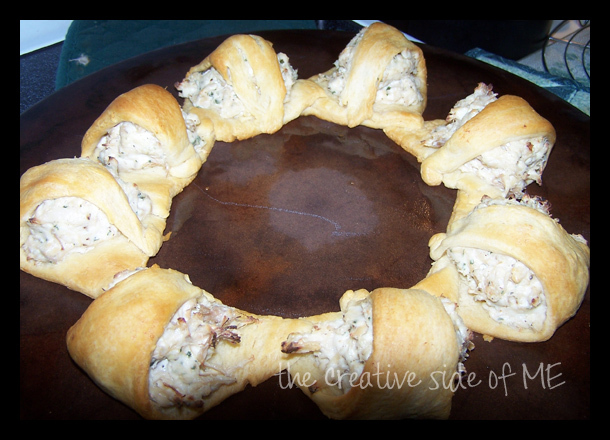 I found this Turkey Crescent Wreath over on Bethany's blog and decided to give it a try. Don't let the simple ingredients fool you - this recipe is fantastic! You could also easily substitute leftover chicken, as well! Combine 2 cups of shredded turkey or chicken, 1 8-oz package of softened cream cheese, 1/2 teaspoon of seasoned salt, and 1 teaspoon of dried minced onion. Bake in a preheated 375 degree oven until golden brown, about 20 minutes. Yep, that's it! Now, eat and enjoy! Yum, yum! 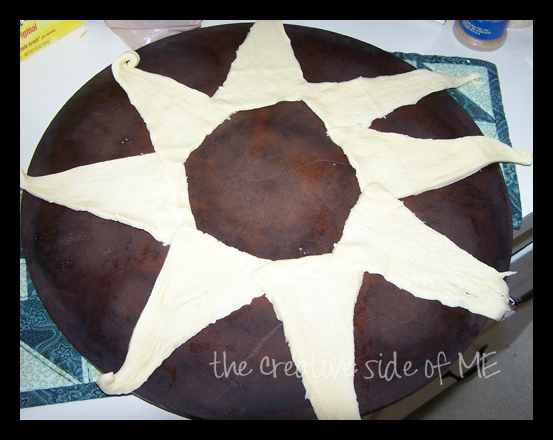 Arrange crescent dough in a circle, with large ends overlapping, on a round baking sheet. 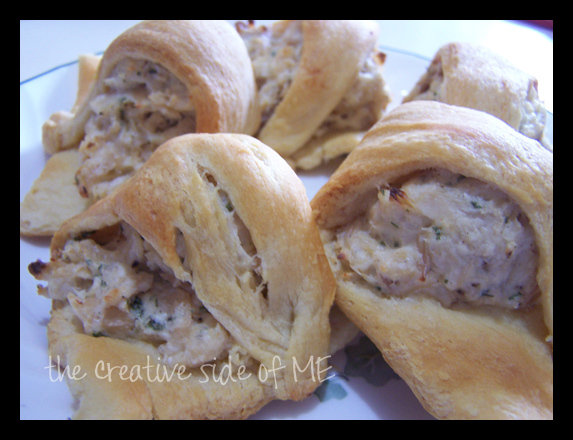 Combine turkey, cream cheese, seasoned salt, and onion. 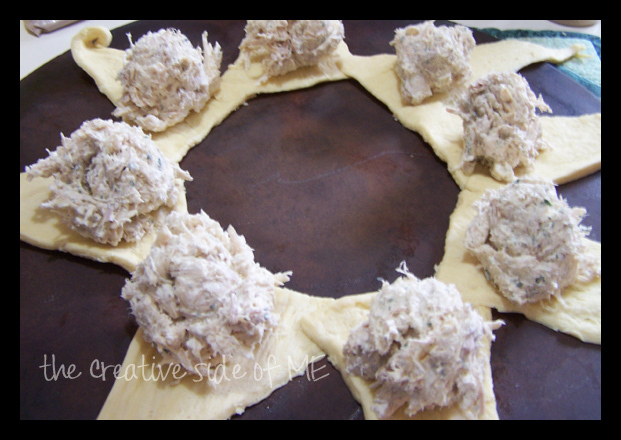 Place meat mixture evenly on dough. 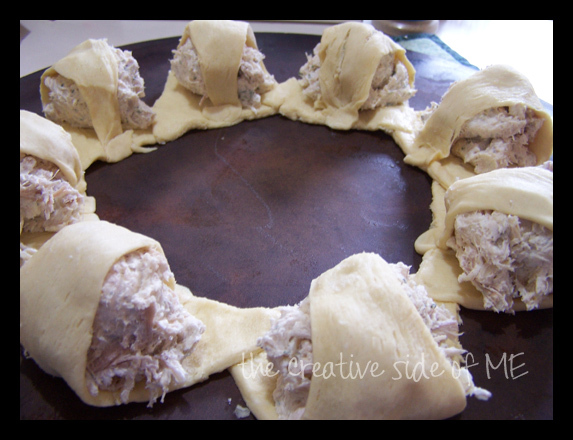 Wrap meat with small ends of crescent dough. Bake at 375 degrees until golden brown, about 20 minutes. Unfortunately for my family, these little morsels won't be on their cookie platters this year. I think the reason is perfectly understandable. So, here's the recipe so they can make their own batch! 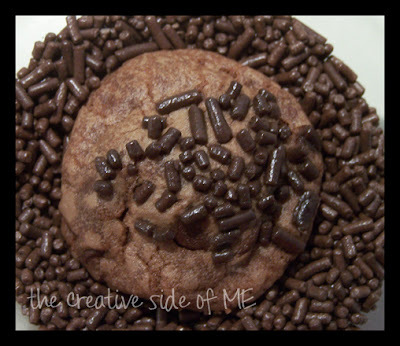 In a large mixing bowl, cream butter, sugar, and cocoa until light and fluffy. Beat in sour cream and vanilla. Add flour; mix well. Stir in chocolate chips. Refrigerate for 1 hour. Shape into 1-inch balls; dip tops in chocolate sprinkles. Place, sprinkled side up, 2 inches apart on ungreased baking sheets. Bake at 325 degrees for 10 minutes or until set. Cool for 5 minutes before removing to wire racks to cool completely. Yield: about 5-1/2 dozen.